In years to come, when they collate the 'Greatest Hits of John Costello' his 2017 report to convention will surely be the album from which they draw the greatest number of hits. Two years ago, Dublin's highest ranking GAA official playfully noted "It would appear Charles Dickens' Ebeneezer Scrooge has taken up residence off Jones Road this festive season!" after the GAA's decision to grant Dublin €15,000 for their holiday fund 48 hours before fining the County Board the exact same amount for Dublin's part in the Fenway Park Brawl. Now, in what annually tends to be his only public homily, Costello has evoked both the Mister Men and Magic Roundabout in his latest barb, a Christmas selection box of retort to some of the less flattering commentary of the Dublin senior footballers and Jim Gavin in their season of three All-Irelands in-a-row. "Maybe some commentators should examine the 'Cult of Me' which seems very much in vogue with some of them," he writes. "For example have a go at the Dubs, then sit back, get invited as a paid guest onto various radio shows etc - kerching, cha-ching, cha-ching, kerching!" Costello also robustly defends Gavin over his demeanour in the moments after the All-Ireland final. 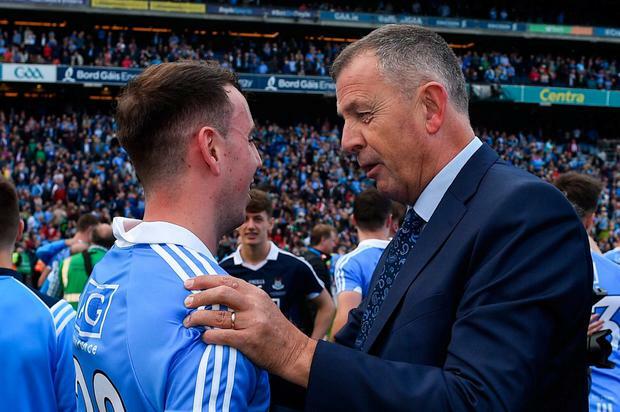 "As Jim, rightly, does not see his first priority as Dublin manager to provide a 'Turn Down' service for the media, he was accused of effectively being very hostile and that his delay in getting to the media area was provocative," Costello points out. "Perhaps we'll have to get Jim to wear a GPS tracker in future, to give up to the second information on his location. In fact, I think there was a spare one knocking around on All- Ireland Final Sunday!," he adds in a tongue-in-cheek reference to the GPS pack thrown by Lee Keegan at Dean Rock. Costello goes to on to brand some of the more recent calls to split Dublin for the purposes of giving a larger number of players from the capital a chance to play inter-county football as "an attempt at engineering dissent and not really a genuine, heartfelt plea for the 'boys on the hill' to be thrown a Dublin jersey." Costello also uses his latest report to address some of the "recurring 'beliefs' about the perceived advantages the capital's inter-county teams enjoy". In a typically hard-hitting document, Costello has emphatically rejected the accusation that Dublin's elite footballers and hurlers have meals delivered to their homes and denied their treatment as being "five star" or "all expenses paid". He writes: "Myth 1: Our senior teams have meals delivered to their homes on a daily basis or ever in fact. UNTRUE. "Myth 2: Our senior teams are given five-star, 'all-expenses paid' treatment. UNTRUE." "The hard yards every year are done in Innisfails GAA club in late winter/spring before they move to St Clare's, DCU for Championship preparation. "Last year," Costello revealed, "two training sessions were cut short owing to floodlight failure at Innisfails.